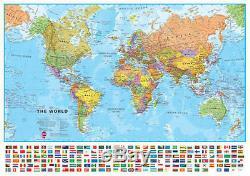 Maps International is officially the UKs best sellers of World Wall Maps. Maps Internationals large world political wall map is simply stunning. Our large political world wall map comes with a panel of country flags along the base of the map. Perfect for helping children learn about the world and countries in the news. Map details: Our large politically coloured world wall map features every country in a different colour, with country boundaries shown clearly. All major towns and cities are highlighted on our world wall map and capital cities are clearly shown. The map contains hill and sea shading bringing the map to life. The panel of flags along the base of the map and population facts and figures makes this map really interactive. Map uses: As with most of our maps, the large world political wall map with flags, is available in a range of finishes making it suitable for a variety of locations. One of our most popular world maps - educational and sensational looking! Perfect for classrooms, and for use in family room. 136cm (w) x 100cm (h) Framed. 121cm (w) x 89cm (h). Finishes: See Below- Many Available. Your map is printed onto 110 gsm paper and is left unfinished. Your wall map will be finished with a gloss encapsulation process. Encapsulation means that the maps are heat sealed between two sheets of industrial quality film. Please note that the edges of this map are not sealed. Encapsulation gives the map a write on wipe off finish, meaning that, using the appropriate pen (for whiteboard use) or Chinagraph pencil any writing on the map can be wiped off with a damp cloth. We gloss laminate your map and supply with a set of brushed aluminium effect hanging bars. This option is great for a low cost way to make your map look really smart. These allow you to hang the map using nails whilst adding a stylish finish. Your map will be supplied mounted onto hardboard (Foamex). A modern finish suitable for any use, at home or in the office. This board can be directly screwed to the wall. For this option, your map will be supplied mounted on pinboard and framed in a stylish brushed aluminium frame, with a 16mm edging. Ready to be hung on the wall of any office or branch, your map will be supplied with a hanging kit. You are also able to use your map with drawing pins creating a useful operational tool. The item "Large World Wall Map (POLITICAL) Including Flags FREE UK SHIPPING" is in sale since Tuesday, April 14, 2015. This item is in the category "Art\Art Posters". The seller is "mapsinternational" and is located in Witney. This item can be shipped to United Kingdom.